I am Soroosh Riazi, editor-in-chief of a monthly music magazine, named “Music Report”, published in Iran. 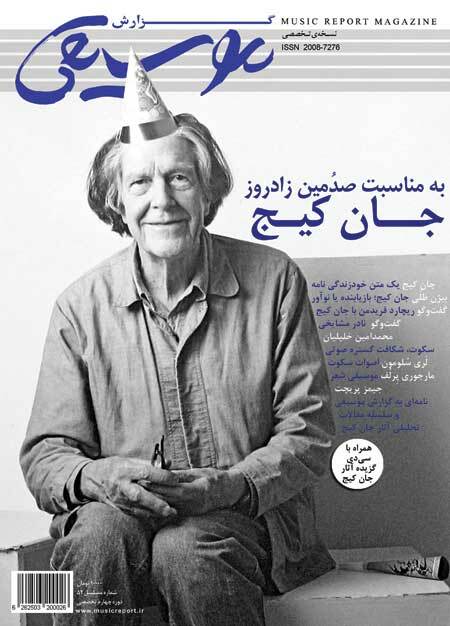 I am going to publish a special issue about John Cage. The translation team of our magazine has translated some of your writings to Persian and these translations will be used in our Cage issue. I will be grateful if you may write a short text for readers of this issue. I will send you an issue in token of keepsake. Is it necessary to learn Buddhism and other philosophies if someone wants to create a work of art according to thought of Cage? Concerning Cage’s doctrines and specially his belief that sounds are divine impacts which are perceived through nature, can we imagine that Cage was affected by religious thoughts? It seems that presenting Cage’s music can be attractive for addressees just in a performance way and it would not aurally be so desirable for many people and even the elite. So can we basically consider this art as a performance art? Rather than answer them one by one, I decided to write a short letter to the readers of Music report that covered most of the questions in one way or another. Soroosh caught me ducking a couple of the questions and asked for revisions to include them, which I did. I like the original version better as a text, though, so that’s the one I’m posting here. While working on this, I was keenly aware of the tensions and animosity between the governments of our two countries. As it happens, I was in the middle of reading Scott Peterson’s hugely informative book on modern Iran, Let the swords encircle me when I first heard from Music report. Peterson eloquently points out the similarities between the USA and Iran, even as he shows the potentially lethal frictions between the countries. Part of my intent was, as hokey as it sounds, to make a personal connection between this American and Iranian musicians that will demonstrate the goodwill always available to people, if not always to their governments. People inhabit a much larger world—and I like to think a much kinder world—than governments do. Update: Alex Ross reminds me that he reported on “Cage in Iran” back in 2007. Scooped!